Built 1930 by a Chinese architect as "Nanking Theatre" on the site of a former cemetery. Opened 25 Mar 1930 with the movie, Broadway. Originally used as a cinema. 1949 renamed "Beijing Movie Theatre". 1959 renamed "Shanghai Concert Hall"/"Shanghai Yinyueting". Since 1959, used for symphonic concerts. 2002-2003 the whole building is moved to the South by 100 metres. 1122 seats. 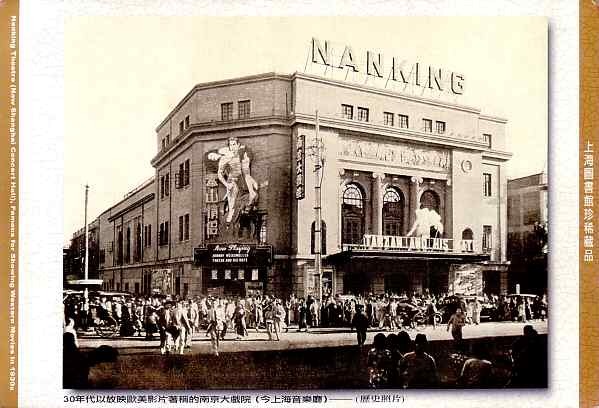 Front Text: "Nanking Theatre (Now Shanghai Concert Hall), Famous for Showing Western Movies in 1930s", inscription: "Nanking", marquee: advertising the 1934 movie, "Tarzan and his Mate"